Watch a helicopter fighting fires in the UK. Find out about an air ambulance in London, UK. Go on a helicopter search and rescue mission in the mountains of Canada. A Mil Mi-26 Halo helicopter delivers a boat by air. Watch a stunt pilot perform loops, rolls and bunts in a helicopter. See helicopters set a world record for the biggest formation flight ever. A short guide to how helicopters work. See a Chinook helicopter in action, filmed at an airshow. A crew member from a Chinook shares details of his helicopter. An Apache helicopter crew prepares for a quick take off. Find out about Sikorsky's CH-53 helicopter, with videos and a photo gallery. See the latest photos of US military helicopters at work. Make a simple toy that shows how a helicopter rotor works. 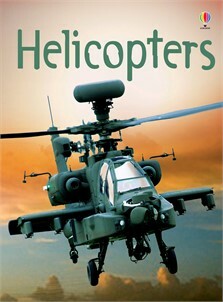 Print out a full-colour poster of RAF helicopters. RAF Museum, with two locations in London and Cosford, UK. Smithsonian National Air and Space Museum, with 2 locations in the US. The Helicopter Museum in Pennsylvania, US. Canada Aviation and Space Museum in Ontario, Canada.